Is the right truly this despondent over John McCain potentially being their nominee or is this just another stunt on her part to get attention? In related news, hell has frozen over. She said on Hannity & Colmes last night that Clinton “is more conservative than he is” and adds that in that scenario “she will be our girl.” As president she would be “stronger in the war on terrorism” and would not pull the troops out of Iraq, pointing out that she jumped to her feet at the State of Union speech when President Bush said the surge was working (and Obama did not). Alan Colmes says Hillary would say “no” to Coulter’s offer to campaign for her. But Coulter goes on: “Hillary is absolutely more conservative” and moreover “she lies less than John McCain. 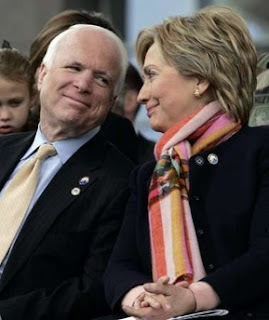 And she’s smarter than John McCain so when she lies she knows it….John McCain is not only bad for Republicans he is also bad for the country.” Hannity doesn’t agree.